Last Saturday morning was a wet, wild, windy January day. Most Acton residents would have preferred to have been sleeping off the excesses of their Christmas and New Year celebrations, or at least sitting in the warm with a cup of coffee over a newspaper. 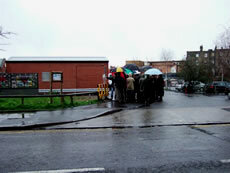 However, over 35 people turned out despite the weather conditions to watch Ealing Council planners on a site visit to Churchfield Road to approve a planning application. There were a number of local councillors present including Marie Randall and Vlod Barczuk. Acton History Society was represented as well as a number of members of the Churchfield Community Association. 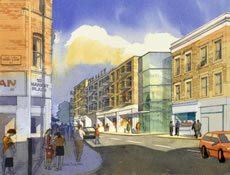 Vlod Barczuk, Acton Central Councillor, has described the proposed development as: "inappropriate" and cites many reasons for rejecting the application, including loss of light to neighbouring properties, impact on existing retail businesses, failure to take account of Acton Town Centre conservation area, failure to address parking problems that will be created by the development, impact on local schools, loss of green space, loss of public art, inadequate public consultation. Residents and Concillors had a number of different concerns. Camilla Phelps had collected around 75 signatures from inhabitants of closely neighbouring Grove Place, all against the development. 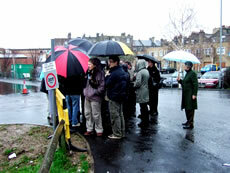 As Councillors and residents looked at the site, one councillor remarked on the lack of play provision in the plans. Others worried about parking provision and loss of lightfficers from Ealing Council to the land between St. Mary's and Hooper's Mews in Churchfield Road. Dominion Housing Group, Metropolis Planning and Design LLP has submitted a planning application in October last year to Ealing Council for the redevelopment of part of the Oaks car park and relocation of the art screens. Everyone was very well behaved and there were no chants, placards or slogans from the crowd. The Councillors were left to ask most of the questions as everyone waited patiently. After a while, someone asked: "do the angry mob get to speak?" Nancy Duin, an executive member of the CCA, said that representatives from Dominion Housing Group were extremely pleasant when dealing with the concerns of the crowd, but commented that this in no way made her change her mind about the building. Dominion Housing Group along with Metropolis Planning and Design LLP plan a large number (72) of residential units to be built in what is currently a car park at The Oaks. The buildings would be 2, 4 and 5 storeys high - which many feel would overshadow neighbouring Hoopers Mews and St Mary's Burial Ground, effectively changing the landscape. Residents who viewed the drawings described them as 'hideous', 'unimaginative' and 'out of keeping with the surrounding architecture'. The Planning Committee will make its decision after considering the application at a meeting to be held in the Council Chamber, Town Hall, New Broadway, W5 2BY on January 10th 2007 at 7:00pm. The Churchfield Community Association have announced that the officer in charge of making the decision about the development is recommending approval of the development. Residents are greeting this news with dismay. Currently, Churchfield Road is developing slowly as a street with attractive small shops - like Vanilla, Paint, Heart and Soul, Classix barbers, Anthony Wood (the newest addition to the road - an upmarket hairdresser). The buildings are mostly Victorian 3-storey and the road has an old fashioned feel to it. There is definitely a community spirit in this part of Acton, despite problems which Police, Council and others work hard to eliminate. There is a petition against the development which anyone can sign, in Vanilla - there is still time to sign it and it is still important that as many people as possible who wish to register their feelings about the development make their feelings known.